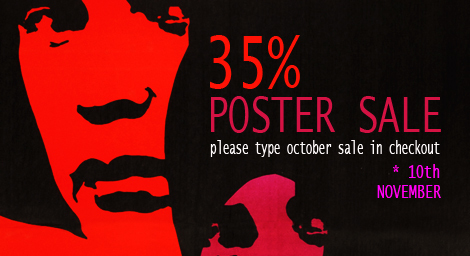 Movie Posters Sale, 35% off your basket. 35% Movie Posters SALE. Free shipping on multiple orders. – into a coupon field when checking out. Movie Poster Sale will run until 10th of November 2016. Enjoy browsing! Please spread the news by sharing around (links bellow). Note: Posters currently on sale won’t work with the coupon. Rudolf Altrichter‘s Girl from the Mountains (1972) movie poster was used in the image above. Subscribe to our daily / weekly newsletter for shop / blog highlights and special offers.